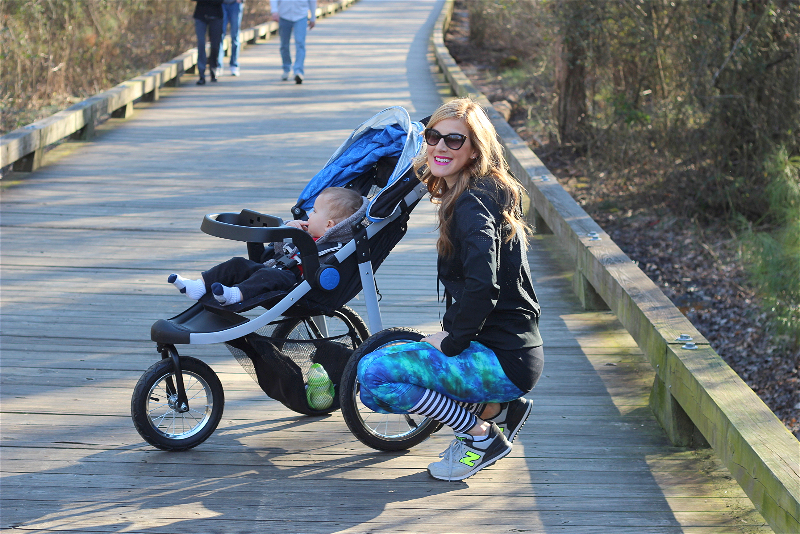 Jogging Stroller: c/o Delta Children, Jacket, Leggings, ShoesI have been DYING for a jogging stroller so that I can start running again! The J is for Jeep Cross-Country All-Terrain Jogging Stroller by Delta Children allows you to stroll, speed walk or jog across any terrain. The front wheel locks in place for when you want to jog, or unlocks and swivels for walking across any type of surface. I love how easy it is to push and that it has a five-point safety harness (with reflective material on it as well!) to keep my little guy snug and safe. He loves to sit up and hold onto the child tray to get a good view while we are on the trails. The child tray is great too, because it swings in and out to allow you to unload and load it with ease. There is also a parent tray (not pictured) that has cup holders and an enclosed storage space to keep your phone or other essentials. The quilted canopy has an extended sun visor that is nice to have when we run through any sunny spots. I’m so excited about using this stroller now that the weather is getting nice. I am starting back slowly, but I gotta be honest, getting back in shape AND pushing a jogging stroller is tough! I went for 30 minutes straight this past weekend and was dying up those hills! Hopefully in a few weeks, I will be running longer and feeling better!